Anthropologists learn a lot about early humans and our ancestors by studying fossilized teeth. Teeth are a great source of information. Not only are they the most preserved skeletal remains found in fossils, but they are small and very mineralized, making them resistant to decomposition and able to maintain their original qualities. Also, they contain a record of a lot of aspects of their own development, including their chemistry and pathology. Things like microscopic wear on the chewing surfaces of teeth and the presence of stable isotopes and trace elements in fossilized teeth can tell scientists what kind of food an individual ate. Ninety-nine percent of humans’ evolutionary history was spent eating foods that were hunted or gathered. Our current diets of soft, processed and sugary foods are nothing like the diets for which our teeth are adapted. Natural selection has not prepared us well for the kinds of food we eat today, which is why cavities and plaque buildup are so common. In addition, soft diets do not stimulate jaw growth, and teeth, especially our third molars (wisdom teeth), become impacted. As a result, modern humans are much more likely to have misaligned teeth that require orthodontic treatment or surgery. In fact, third molar impaction became 10 times more common after the Industrial Revolution than it was previously. 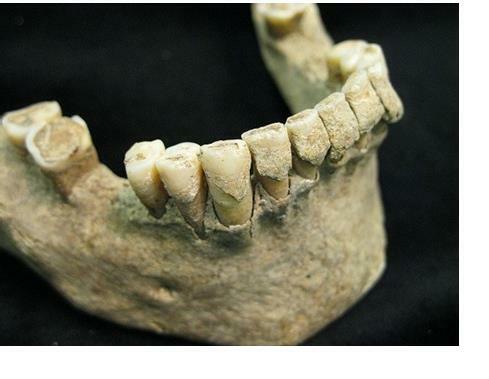 Debbie Guatelli-Steinberg, a professor of anthropology at Ohio State University, speculates that future anthropologists will “likely have a field day” studying modern human teeth. “In various cultures today,” she says, “we have people who notch teeth, inlay them with jewels or gold, lengthen them, file them down and remove them altogether.” Should make for some interesting research down the road. Looking for a dentist in the Troy and Birmingham area? Dr. Douglas Angell utilizes the latest dental techniques and technology to help each patient achieve a beautiful, healthy smile. Call us to set up an appointment and be sure to visit our website at: www.angellsdentistry.com. This entry was posted in Angell's Dentistry, dental research, dentist search Troy MI, Dr. Douglas Angell, find a dentist Birmingham MI, find a dentist Michigan, find a dentist Troy MI, local dentists Troy MI, Michigan dentists and tagged early human teeth, fossilized teeth. Bookmark the permalink.